1. Safety: sidemount configuration provides a completely redundant and independent air system with the valves, regulators, and hoses in plain view and easy to reach should a problem arise. 2. Control: sidemount configuration enables buoyancy, balance, and trim control resulting in a much more streamlined profile making moving through the water easier and more efficient. 3. Comfort: single tanks can be easily transported to and from the dive site thereby reducing strain on the diver’s back, knees, and ankles from carrying loads long distances. 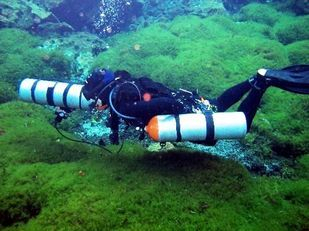 The primary focus of this Introduction to Sidemount Diver course is to offer the diver who has never tried it before an introduction to diving in sidemount configuration in open water. 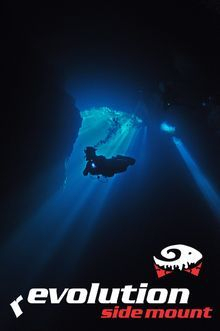 For the diver with a cave certification, this course will teach the skills and procedures necessary to cave dive in sidemount configuration but still in a larger cave as it takes time to fully master any new equipment configuration. 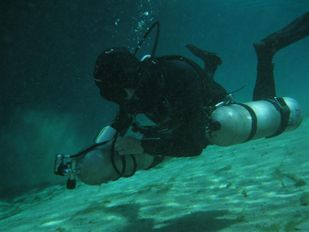 The Sidemount Diver course requires a minimum of 2 days. During this course you will learn skills including gear rigging, hoses, trim, buoyancy, gas management, valve shut down exercise, donor and receiver to an out of air diver, ditch and don of tanks, in-water tank management, various propulsion techniques (frog, modified flutter, and shuffle kick), helicopter turn while maintaining neutral buoyancy, and more! After completion of this course we recommend to divers wishing to enter smaller caves to first complete some dives in larger caves to build up some experience and to master the basic skills and procedures of diving in sidemount configuration before moving on to the Advanced Sidemount Diver Course, which is a more intensive and demanding course requiring a high comfort level in a more challenging and fragile cave environment and the ability to dealing with possible stressful situations. Please contact us if you would like to receive more information about the Sidemount Diver Course or to make a reservation.